Since first appearing in 2003, Mazda’s Mazda3 has been both a revelation on the road, and a disappointment in the marketplace. We chalk it up to a lack of marketing dollars, as despite the 3’s excellent handling and fuel economy, it still manages to be outsold by competitors that include the Chevrolet Cruze, Hyundai Elantra and Nissan Sentra. Go figure. Nonetheless, if you enjoy great handling small cars, you’re missing out if you haven't driven a Mazda3, because the latest example is the best one yet – and that’s saying something. 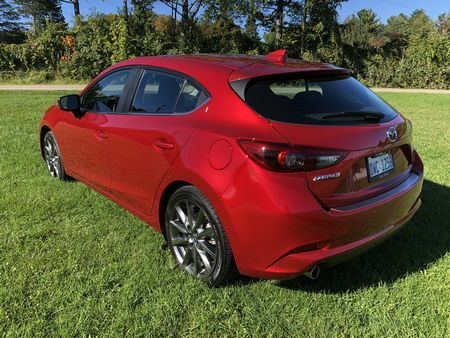 Outside the newest Mazda in both hatchback and sedan versions is at the top of its class and looks as if it could easily cost thousands more. 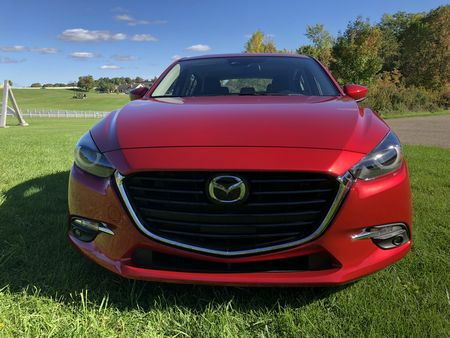 The sedan is a seven-tenths version of the stunning Mazda6, while the hatchback does an even better job of expressing the 3's sporty demeanor - with both taking advantage of last year's mild refresh. It starts up front with the brand's requisite five-point grille replete with a wing-shaped chrome trim piece that traces the lower two-thirds until it meets the headlamp enclosures. On Grand Touring models like our tester, those enclosures contain Bi-LED headlights with auto-leveling and LED daytime running lights that complement the standard LED taillights. 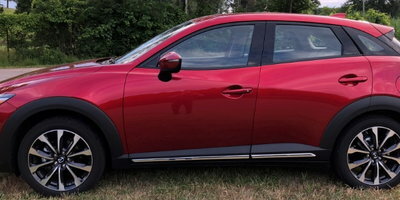 Below the grille and above a lower air dam, a lower valance with a narrow lower air intake is flanked by pods that, on the Grand Touring trim, house small, round, LED fog lights. Moving back, three character lines trace arcs from the front fenders to the front door handles, above the rear door handles to above the tail lights (the sedan's more formal look means this arc begins just behind the C-pillars), and from behind the lower front wheel wells to halfway up and just forward of the rear wheel wells. Marching through the lineup, 16-inch steel wheels wrapped in P205/60 R16 all-season tires are standard on Sport models, while both Touring and Grand Touring trims (like our tester) sport 18-inch alloys finished in dark silver, and wrapped in Dunlop SP Sport 5000 Symmetrical P215/45R18ultra high performance all-season tires. 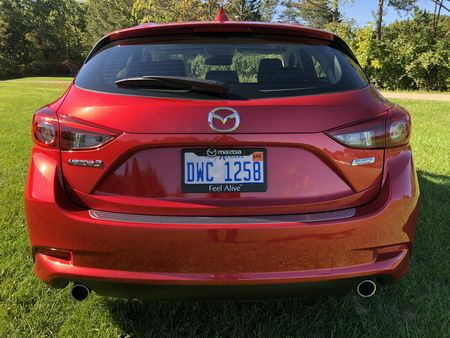 Due to their differing body styles, the horizontally-placed tail lights are wider on the sedan, although we prefer the sportier overall look of the hatchback that also has a standard rear wiper and, jutting out under the valance, bright-finished dual exhaust outlets. Step inside, and you'll find an equally impressive cabin, with an intuitive layout that, courtesy of additional sound insulation, is quieter than in previous years. 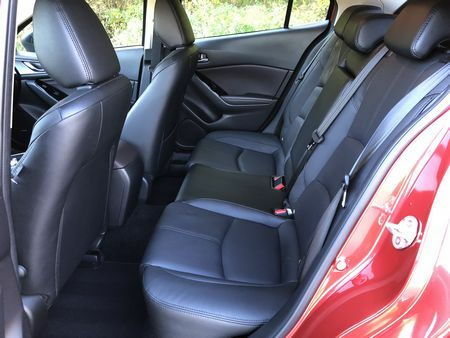 The front seats are supportive and the nicest you'll find this side of a pair of Recaros, with large cushions and big seatbacks that offer a natural position. 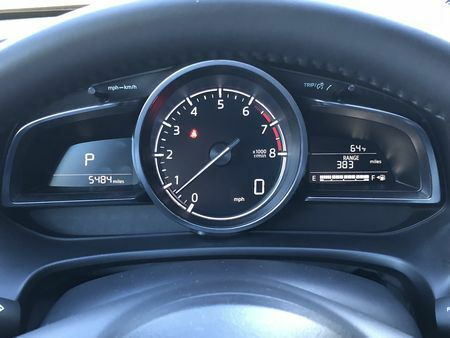 Most surfaces are covered in soft-touch materials, the gauges in front of the driver - Grand Touring models feature a prominent center tach containing a digital speed readout flanked by a transmission indicator to the left and information center on the right - are straightforward and easily understood. 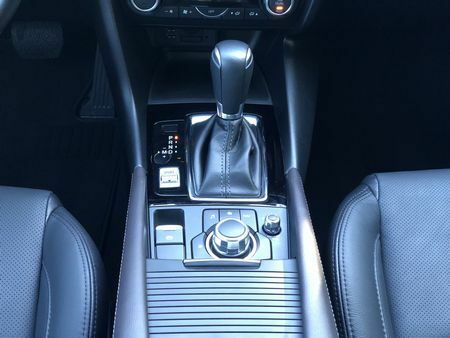 The dash layout and much of the trim is above average, with the standard perforated-leather on the Grand Touring offering occupants a luxury-level look and feel. 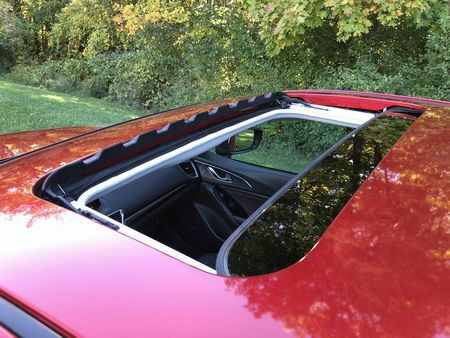 Thanks to a low cowl and beltline, and relatively narrow C-pillars, the driver’s views out the front, sides, rear three quarters, and back range from very good to excellent. 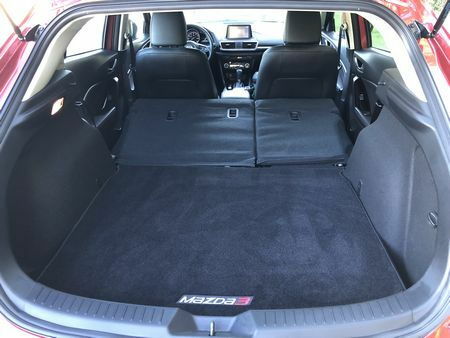 But all is not perfect, as the sleek shape of the hatchback, in particular, cuts into rear seat headroom, where leg room on both body styles is already tight for the class. The somewhat chintzy headliner and hard plastic rear door trim are also disappointments in an otherwise splendid cabin. 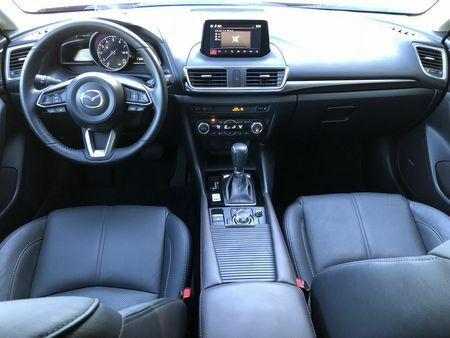 Moreover, the sedan's trunk falls short at a mere 12.4 cubic feet and, over the years, it seems that Mazda's infotainment system has gotten more complicated, not simpler. Not only is the current setup distracting, it lacks both Android Auto and Apple CarPlay. For 2018, two engine choices are offered, both featuring Mazda's Skyactiv suite of technologies that include direct injection, variable valve timing and, in both powerplants, a 13.0:1 compression ratio. 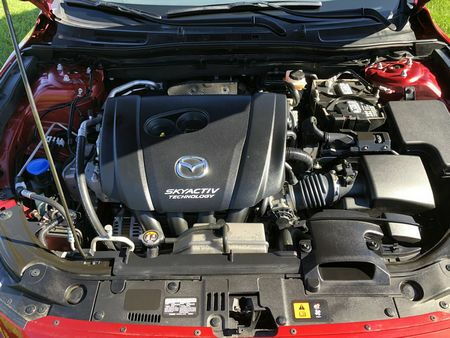 Sport models are powered by a Skyactiv-G 2.0-liter engine generating 155 horsepower and 150 lb-ft of torque. Touring and Grand Touring trims like our tester feature a Skyactiv-G 2.5-liter engine the produces 184 horsepower and 185 lb.-ft. of torque. Both engines can be paired with either a standard six-speed manual or optional six-speed automatic. Fuel economy for both is stellar. 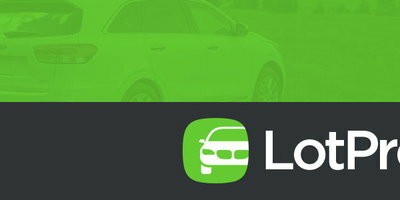 The 2.0-liter engine in the hatchback gets an EPA-estimated 28 miles per gallon in the city, 37 on the highway, and 32 combined with the automatic (sedans score a slightly lower 31 combined), while sedans show an EPA-estimated 28 miles per gallon city, 38 highway, and 31 combined with the manual (hatchbacks receive slightly lower 27 city, 37 highway ratings). Meanwhile, manually-equipped models with the larger 2.5-liter four-cylinder score an EPA-estimated 27 miles per gallon in the city, 37 on the highway, and 31 combined, while sedans equipped with the automatic receive an EPA-estimated 27 miles per gallon city, 36 highway, and 30 combined, with hatchbacks rated at an EPA-estimated 26 miles per gallon city, 35 on the highway, and 30 combined. Our vehicle-measured fuel economy in an automatic-equipped Grand Touring was 27.8 miles per gallon in spirited city driving. The Mazda3 remains one of the best handling vehicles in the compact segment. Both engines offer good performance, while the G-Vectoring Control system taps the brakes a bit to shift weight forward for a tighter line in cornering. The suspension is firm and well damped, the steering is very direct with spectacular feedback to the driver, while underfoot, the brakes never grab and are easy to modulate. At freeway speeds the chassis feels extremely stable - you know right where you are on the road – the 3 always tracks straight and true, and is barely affected by crosswinds. At the same time, the engine never sounds buzzy even at full throttle, the suspension soaks up minor road imperfections with aplomb, while even rough washboard surfaces hardly affect it. 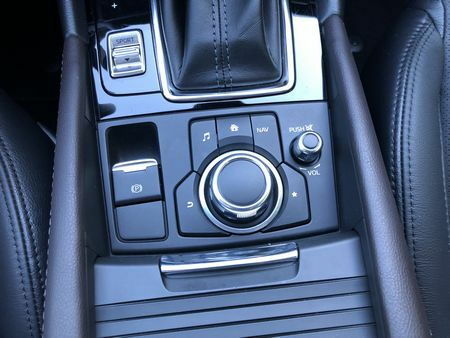 Topping it all off, the six-speed automatic shifts crisply, although enthusiasts will gravitate toward the very enjoyable six-speed manual that offers a clutch that's easy to modulate and a shifting action and short throws that are delightfully smooth. But all is not perfect. 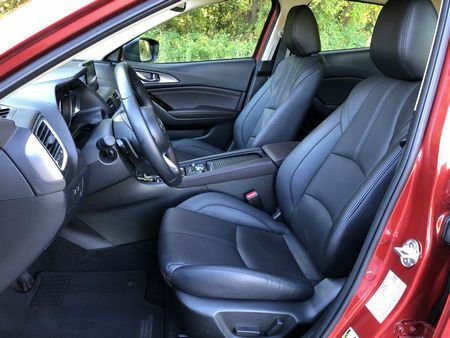 For one, interior sound levels are only average for a vehicle in this class, with quite a bit of wind, road and engine noise entering the cabin – especially over uneven road surfaces and at freeway speeds. And while not unusual for a smaller, non-turbocharged four-cylinder, power in the smaller 2.0-liter engine doesn't come on strongly until around 4,000 rpm, which is on the high side, and the full-electric power steering system isn't as good as the combination electric and hydraulic system on the last-gen car. Finally, the G-Vectoring Control system can sometimes engage a bit too aggressively – especially during high-speed cornering when it can feel like the brakes are being applied to the rear wheels. To simplify matters, Mazda markets the Mazda3 in two body styles with three trim levels each. 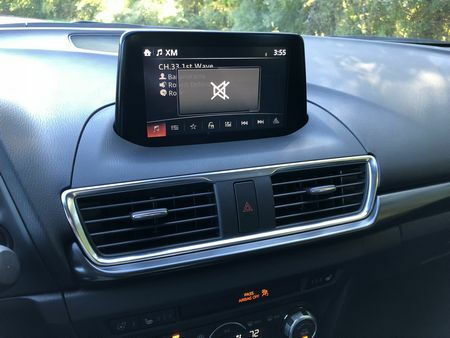 Besides the usual power features (windows, locks, mirrors), the base Sport comes with low-speed automatic emergency braking, a rearview camera, keyless push-button start, a seven-inch touchscreen, and Bluetooth, Pandora, Stitcher, and Aha internet radio integration. Steel wheels are offered on the sedan, while alloys are standard on the hatchback. 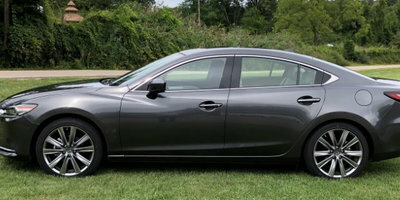 In addition to the bigger engine, stepping up to the Touring model adds larger 18-inch alloy wheels on both body styles, automatic on/off headlights, body-color heated outside mirrors with turn signals, rain-sensing wipers, advanced keyless entry, an overhead console, leatherette seat trim, and a leather-wrapped steering wheel and shift knob. Grand Touring models up the ante with auto-leveling Bi-LED headlights, LED fog lights, daytime running lights, and tail lights, power moonroof, perforated leather seat trim, satellite radio, a color active driving display, and an analog tachometer and digital speedometer (other trims have a digital tachometer and analog speedometer). Blind-spot monitoring with rear cross-traffic alert is optional on the Sport and standard on all other trims. Mazda's most advanced safety features, including automatic high beams, lane departure warning, lane keeping assist, adaptive cruise control, traffic sign recognition, and automatic emergency braking, are optional only on the top-level Grand Touring model. 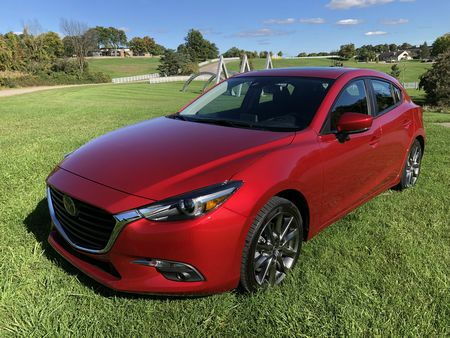 Prices for the 2018 Mazda3 start at $18,985 for a base Sport sedan with a six-speed manual transmission and escalate to over $29,000 for a fully-optioned Grand Touring hatchback with the six-speed automatic and optional paint. Our automatic-equipped 5-door Grand Touring tester had a base price of $24,945. 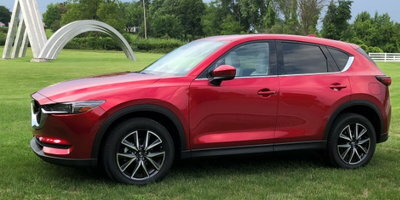 Adding the $1,600 Premium Equipment Package (navigation, paddle shifters, adaptive front lighting, smart brake support, Mazda radar cruise control, traffic sign recognition, auto dimming rearview mirror, heated steering wheel, high beam control, land departure warning, lane keep assist), $75 cargo mat, $300 Soul Red metallic paint, $100 rear bumper guard, $125 door sill scuff plates, and an $890 destination charge, and the as-tested price comes to $28,035. 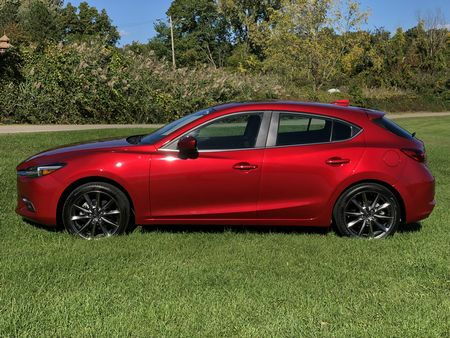 While it disappoints with a cramped rear seat, distracting infotainment system, and advanced safety features that are only available on Grand Touring models, the latest Mazda3 - thanks to a stunning design, superb handling, and two entertaining and fuel efficient four-cylinder engines – continues to be a top pick in the compact class.